You’ve heard it before… if it sounds too good to be true – it almost always is. We hope for some magical, awesome tasting goodness that is bottomless, that is 3 net carbs, contains no artificial anything and stays around 100 calories – yes? Sorry all, it doesn’t exist. I’ve looked. 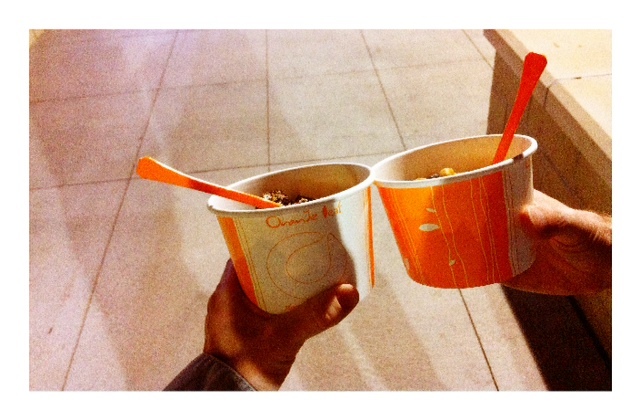 My husband and I enjoyed some Orange Leaf yogurt, after our date night this weekend. The thought of this made me recall the commentary I hear all too often about new frozen yogurt place in our area. (Similar places are setting up all over the country… maybe you have one near you too!) Ours is called Orange Leaf. It sells yogurt that YOU dispense into a bowl, or a waffle bowl, or.. if you’re really feeling wacky – onto a brownie (although I don’t recommend this, I hear it turns the brownie into a frozen ROCK, not to mention it throws out the “fat free” theory further out the window). So I see the “7 carbs per ounce”, and I don’t immediately think, “This is good for me.” I do the math that a 6-7 ounce dish is going to be 42-49 carbs, and about 300-400 calories, depending on what I’m putting on there. Not quite as healthy as you were thinking huh? (Especially considering their totals are for the yogurt ONLY). First of all, not all yogurt is fat-free, and as we know – this is a marketing scheme and doesn’t mean good things, and it doesn’t mean that it’s harmless. It should make you wonder what IS in it if it’s FREE of other things? Secondly… that’s an easy way to get into BIG TROUBLE over consuming calories very quickly. Maybe you didn’t want to read that… (we prefer NOT know – right?) 🙂 But the truth is… you need to be aware for the sake of being healthy for Him, and taking care of your body. There is a reason why you don’t feel FULL when you consume it… it’s empty carbs, and it should be treated as a dessert or special TREAT. Did I mention I’m thankful I don’t live closer to it? Posted on September 25, 2011, in Label Reading, Our Struggles, Truth and tagged Calorie School, healthy eating, losing weight, portion control, reasons to be healthy, type II diabetes, weight loss, working out, worship in body. Bookmark the permalink. Leave a comment.